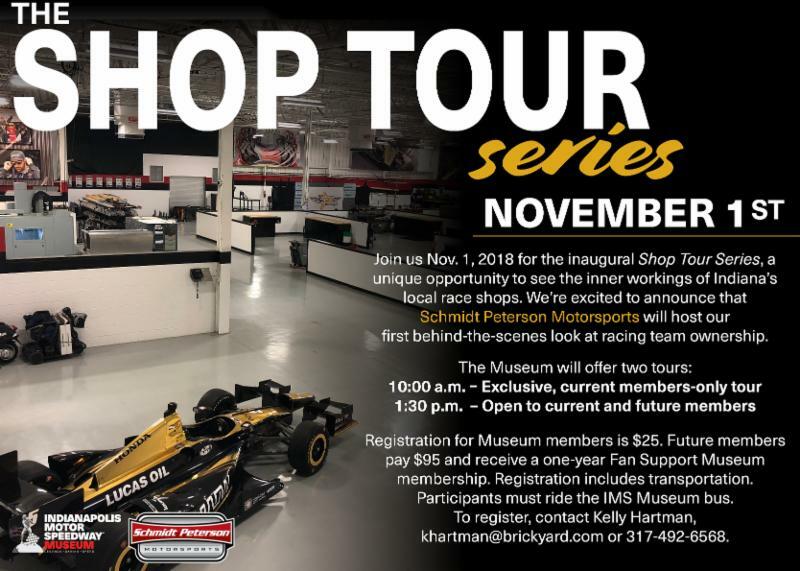 INDIANAPOLIS, Friday, October 5, 2018 – The Indianapolis Motor Speedway Museum is proud to announce its “Shop Tour Series,” where current and future IMS Museum members get a behind-the-scenes look at locally-based IndyCar Series team shops. The inaugural “Shop Tour Series” event will be a trip through the Schmidt Peterson Motorsports race shop on Thursday, Nov. 1. More shop tours, scheduled for 2019, will be announced in the near future. Co-owned by former IndyCar Series driver Sam Schmidt and Canadian businessman and former driver Ric Peterson, the team fields Dallara/Honda/Firestone entries including the No. 5 Arrow-sponsored car for James Hinchcliffe, the No. 6 Lucas Oil entry for Robert Wickens, and also the No. 60 AutoNation entry for Jack Harvey, in conjunction with Meyer Shank Racing. Two tours will take place on November 1: a 10 a.m. (ET) tour exclusively for current IMS Museum members, which costs just $25, and 1:30 p.m. for current and future members. Registration for future members is $95 and includes a one-year Fan Support membership to the Museum. Members receive a variety of benefits year-round, including discounted entry to “Distinguished Speaker Series” events, the exclusive “Fuel Up Fridays” sessions with notable personalities, and invitations to other exclusive, members-only events. Schmidt Peterson Motorsports was founded in 2001 to compete in the IndyCar Series as well as Indy Lights. SPM has earned more than 70 wins and seven championships in Indy Lights, and in IndyCar has scored six wins (Hincliffe and Simon Pagenaud) and two prestigious Indianapolis 500 pole positions (Alex Tagliani, 2011, and Hinchcliffe, 2016). To purchase tickets for the Schmidt Peterson Shop Tour Series, please contact Kelly Hartman or (317) 492-6568. The IMS Museum is open 9 a.m.-5 p.m. March-October, and 10 a.m.-4 p.m. (ET) daily in November-February. To plan your visit, log onto www.indyracingmuseum.org, or call (317) 492-6784.